This entry was posted in Cetaceans, Dolphins and tagged air guns, BlueVoice, Dolphin, Hardy Jones, oil exploration, Peru, sonar, stranding by Kirsten Massebeau. Bookmark the permalink. 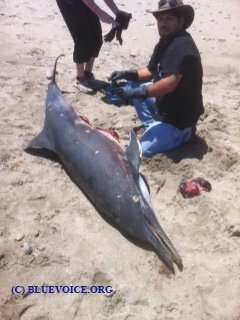 The organization on the beach – ORCA Peru – under the guidance of Dr. Yaipen contends the mass deaths are from injuries brought about by seismic/sonar airguns. The only use of these airguns for mapping of potential marine drilling sites for oil and exploration (sold by the government marine leases)is by BPZ’s geophysical subcontractor pulsing the marine area. Long-beaked Dolphins congregate in the area. They are shallow water mammals. They live to be 40 years old, except now for their dead in Peru. At some point scientists, American mostly, must stop the mis-information and mis-direction and accept what the fact pattern belies – cets are being murdered by military and oil exploration. The International Association of Geophysical Contractors comprises 140 companies at any time anywhere from 55 to 30 vessels are dragging airguns to map where pockets of oil and gas are into Earth’s crust under the seas. Some of these vessels drag 48 guns at a time pulsing every 10 seconds. This in relationship to a human is a nutcase driving through your neighborhood blowing up powerful dynamite at every family’s doorstep. They have figured out the most likely cause..equipment used for searching for oil. they have figured out the most likely cause..equipment to search for oil. Check for radiation or poisoning from Nuclear energy. – Specifically related to Fukushima Nuclear Plant Meltdown, guaranteed. We are hoping that Hardy will have some answers soon. No word on an investigation yet! This planet would be so much better off if humans were the next species to go extinct. This is a terrible thing and must be investigated!! Humans are disrupting nature! and this is the evidence! Dear God!! How awful is this??? Hope they find the cause soon! Hardy has just returned home and will have and update on this horrific mass death of dolphins. No more information on the cause yet.